It’s almost the middle of the week and I’m still living last weekend in this post. That’s all right with how crazy it’s been the last couple of days, I’d rather be thinking about the weekend! Hubby and I stepped out to try a new Chinese restaurant last weekend, Leo’s Kitchen, that had a lot of vegan options on the menu. 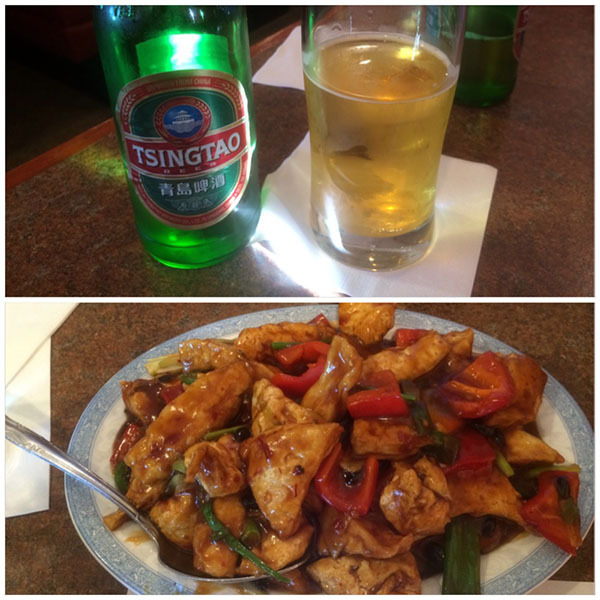 I got a large plate loaded with spicy hunan-style tofu and vegan-friendly Tsingtao beer. There was so much tofu that I couldn’t get through it all, not bad for the price! I was also impressed with the spice level in the dish with large visible pepper chunks. Sunday I headed to Shine Sacramento for another vegan meetup and it was my first time at this cafe. 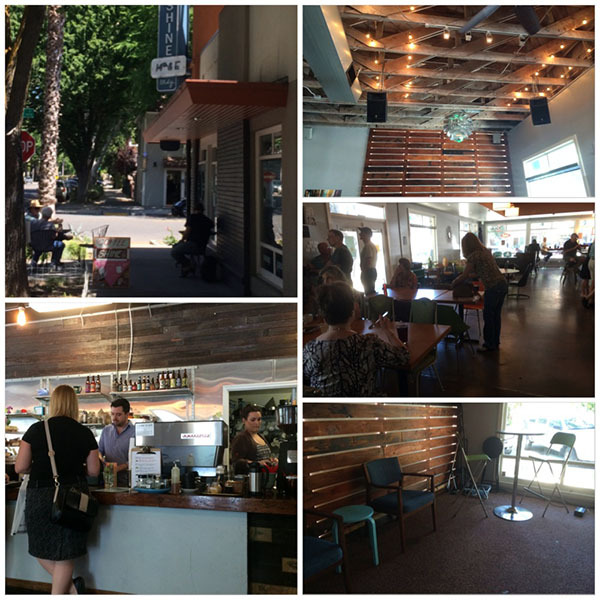 I loved the eclectic urban decor with exposed beams, natural wood, and a fun collection of mismatched chairs. 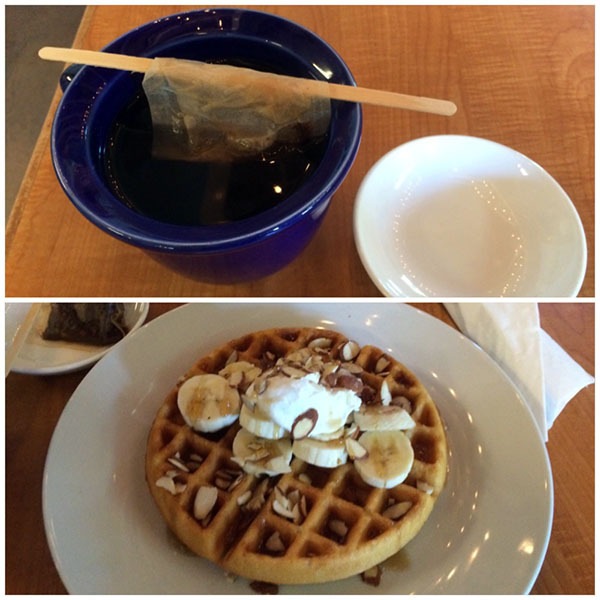 I was looking forward to this meetup for the vegan gluten free waffles on the menu and started with a delightful chocolate tea. Followed by a huge waffle with banana coconut whip cream, banana slices, and almonds. It’s been ages since I’ve had waffles, so this was a real treat and splurge! And chatting with new vegans was also fun sharing stories of why we went vegan, challenges faced, etc. I talked with a nice women who went vegan to deal with diabetes and other health challenges and enjoyed Shine’s house made vegan grilled “cheese” sandwich that also looked amazing. For great food and tea, it was not expensive at all and I can’t wait to visit again soon. 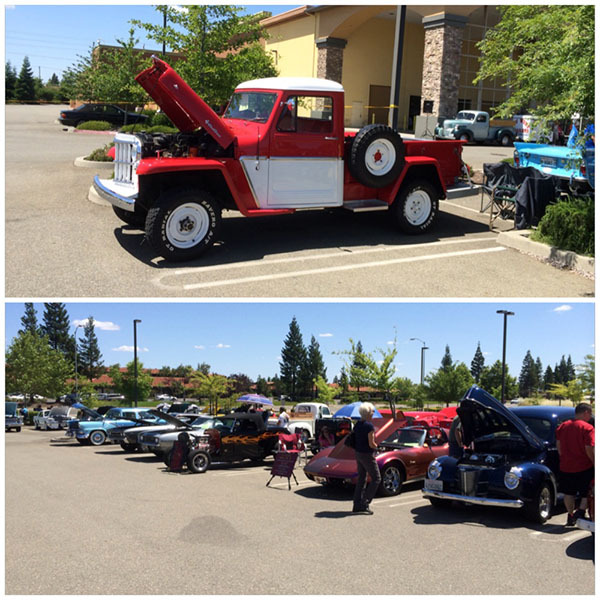 On the way home I stopped by a classic car show that a co-worker was displaying his car at. I’ll admit that classic cars aren’t my thing, I’m more into modern eco-friendly cars with new safety features and couldn’t tell you what half of these cars were. But I admired the passion, effort, and creativity put into these cars, it’s an impressive hobby! 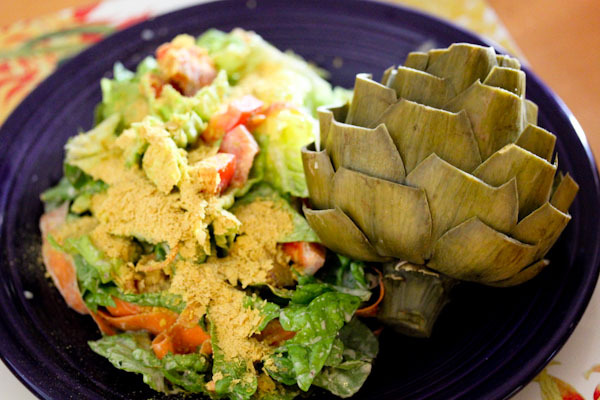 After some splurge eating over the weekend, I cleaned things up a bit the last two days with lots of fruits and veggies including this huge romaine salad coated in a new dressing I created. Again this year I have mint growing all over the place in out garden. Rookie mistake planting it in our garden beds instead of a container a few years ago and it manages to come back every spring in new places. So I’ve been trying to use a lot of it in smoothies and raw dessert recipes. But tonight I tried a savory and tangy dressing recipe with hemp seeds that worked out quite well. The dressing has a refreshing and tangy mint flavor with zing from the lemon juice and mustard for a wonderful flavor combo. 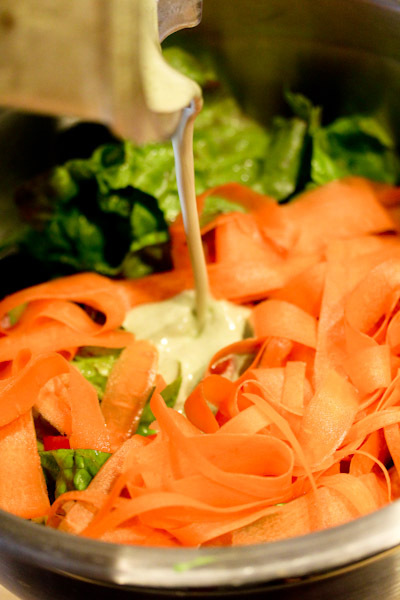 Perfect for a refreshing spring/summer salad. Cool Car Pics! Neat that there was another vegan meetup and more restaurant options…awesome! The dressing sounds right up my alley! I ended up restocking my Hemp Seeds, Chia Seeds, and Nutritional Yeast yesterday! Woot!